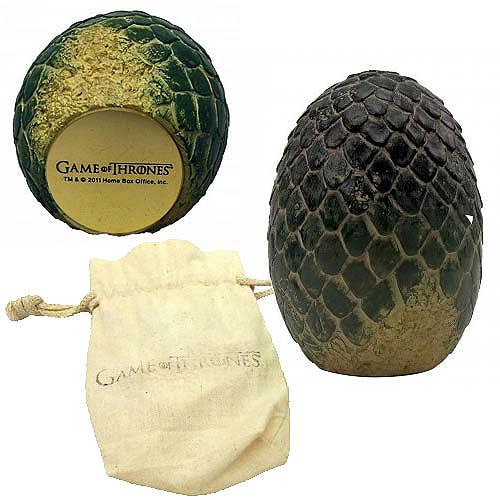 Your very own Game of Thrones Rhaegal dragon egg! Hefty paperweight weighs just under a pound. Finely crafted resin artisan design. This Game of Thrones Rhaegal Dragon Egg Prop Replica Paperweight is a finely crafted piece of memorabilia. A resin-carved green obelisk, the paperweight has aged details giving it an appearance of something you'd find on an anthropologist's desk. The hefty piece weighs just under a pound, measures 3-inches tall x 2-inches wide, and comes in a Game of Thrones protective drawstring pouch with an aged, worn look. Made in the USA.